To celebrate 35 years of the brand, Carolina Herrera’s SS17 collection at New York Fashion Week brought back retro-inspired metallics, denim and gingham patterns for her glamorous and discerning Upper East Side clientele. And what says high-end sophistication more than a faultless half up-do? Once again Herrera’s impeccable style was complemented by a sleek and polished look by legendary TRESemmé New York Fashion Week Ambassador Orlando Pita. Following on from his iconic sumo-knot-inspired look from SS15, Pita created a chic flat bow for spring 2017, where super shiny locks were woven into neat, hidden ties for a sleek half up-do. 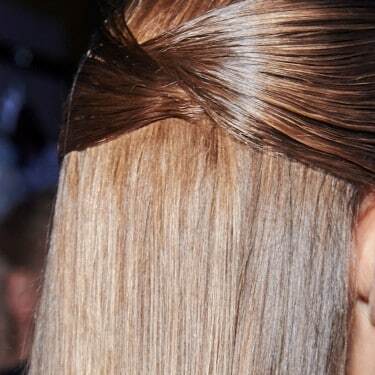 It’s an origami hairstyle that’s all about tailored elegance. Here’s how to perfect the chic bow for some serious Upper East Side sophistication. A moisturised mane is essential for achieving the glass-like finish. Cleanse with TRESemmé Keratin Smooth Shampoo and Conditioner for smooth-feeling locks ready to be styled. Then work in a small amount of TRESemmé Keratin Smooth Weightless Shine Serum from mid-lengths to ends – one pump into your palm will do – before blow drying your hair straight using a round bristle brush. Run your flat iron over your hair, brushing out any kinks or stray hairs first as needed. Then spritz on TRESemmé Botanique Damage Recovery Oil Elixir for healthy-looking shine without heaviness. Make a deep side parting, then comb your hair back. Taking a two-inch section from just above your ear, sweep it across to the opposite side and fix it to a small section of your hair with a small clear elastic band. Then repeat this on the opposite side. Now tuck the hair bands under the 'bow' on each side to keep them hidden. Tip: use bobby pins to tuck in the remaining hair and secure in place. Smooth any remaining flyaways with a soft bristle brush, then finish the look with TRESemmé TRES TWO Extra Hold Hair spray. And voilà! You’re ready to step out with the crème de la crème of New York’s finest. A fresh take on this timeless look.